Teacher diversity in K-12 classrooms is a problem for school districts across the country. Although people of color constitute more than one-third of the U.S. labor force, less than 20 percent of teachers identify as people of color. In some cities, the problem is especially acute: In Boston, there is one Hispanic teacher for every 52 Hispanic students and one black teacher for every 22 black students. Meanwhile, the ratio of white teachers to white students is one to fewer than three. 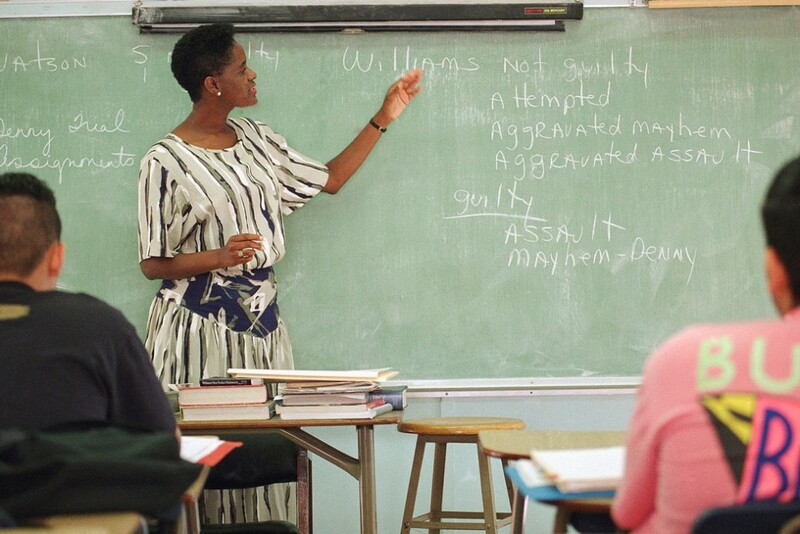 The Center for American Progress’ recent nationwide survey of school districts’ human capital practices found that nearly half of school districts believe that teachers of color are “very difficult” to hire. The lack of teachers of color in classrooms was a problem that CAP first highlighted in the 2011 report “Teacher Diversity Matters,” which included a new approach—the teacher diversity index—that ranked states on the percentage-point difference between teachers of color and students of color. At the time, the findings were stark: While students of color made up more than 40 percent of the school-age population, teachers of color were only 17 percent of the teaching force. CAP later released a follow-up report in 2014 that looked at 2012 data. The report found that the demographic divide between teachers and students of color had increased by 3 percentage points. In an effort to keep up the drumbeat, CAP decided to run the numbers yet again. This time, in CAP’s 2017 review, the authors looked at available data* from state education agencies for the 2013-14, 2014-15, and 2015-16 school years. The authors determined that teacher diversity numbers have only gotten worse since 2012. Meanwhile, the country’s student population continues to grow more diverse. Of the 19 states with more recent data, all states saw an increase in their nonwhite student populations. This should come as no surprise, as 2014 saw the percentage of students of color exceed the percentage of white students in U.S. public schools for the first time. However, as their student populations diversified, some states saw stagnation or decreases in their percentages of nonwhite teachers. These states include: Alabama; Arkansas; Colorado; Delaware; Illinois; Indiana; Kentucky; Minnesota; New Jersey; Oregon; and Washington. 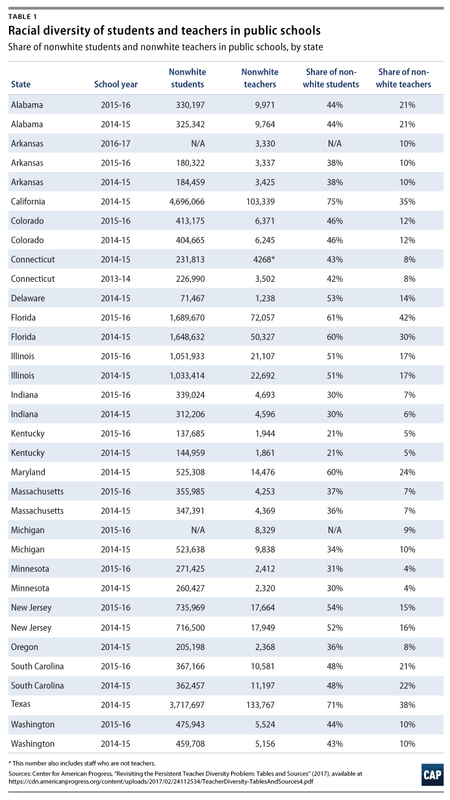 And among states that did post increases in their percentages of nonwhite teachers, only a couple rose more than a few percentage points. For example, Massachusetts’ nonwhite teaching population crept up from 3 percent to 7 percent, while South Carolina’s moved from 19 percent to 21 percent. CAP analysis found that California has the largest gap—40 percentage points—between nonwhite students and teachers. Other states with large percentages of nonwhite students also fare poorly in the analysis. Florida’s gap is 31 percentage points, Texas has a gap of 33 percentage points, and Illinois has a gap of 34 percentage points. Why does teacher diversity matter? Research shows that teachers of color are often better able to engage students of color, increasing high school completion and college attendance rates for these students. And in an era of increased race-based bullying in schools, a diverse teacher workforce can help students develop a more realistic and inclusive worldview. All students, from Massachusetts to California, benefit from a more diverse teacher workforce. There are obvious challenges, however, to building a diverse teacher workforce. Increasing teacher diversity means taking critical steps to fix the leaky teacher pipeline, which means expanding the teacher candidate pool to include more people of color and creating pathways for them to enter the profession. It also means paying and supporting these teachers adequately once they enter the classroom. Thankfully, groups are coalescing around this issue. The TeachStrong coalition, for example, has united a diverse cohort of education organizations equally dedicated to modernizing and elevating the teaching profession. TeachStrong’s first goal is to recruit a more diverse group of high-achieving teacher candidates. In May 2016, the TeachStrong coalition released a set of policy proposals for identifying, attracting, and developing educators of color. The recommendations called for revamped teacher preparation programs, higher standards for teacher licensure and certification, greater time for professional development, and targeted professional learning opportunities to address teacher needs. Nearly 70 national and state organizations have adopted these principles as a viable strategy for diversifying the teacher workforce. The United States’ student population will continue to become more diverse in the years to come. If we want to educate the next generation of young people to become conscientious, open-minded adults, we have to make sure that their teachers reflect our country’s vast and rich diversity. *Correction, July 18, 2018: This link has been corrected so that is contains the correct data tables. Catherine Brown is the Vice President of Education Policy at the Center for American Progress. Ulrich Boser is a Senior Fellow at the Center.